With over 1 billion on-demand streams and widespread acclaim for his global smash 'Nevermind' and rising single 'Never Go Back', Israeli international singer, songwriter, producer, and multi-instrumentalist Dennis Lloyd unveils his highly anticipated debut Exident EP out now via Arista Records through Sony Music Entertainment Australia. "Everyone always asks me when is the album coming? I don't know if I'll ever necessarily release a typical album. People just don't consume music like that anymore and I don't write like that. I write my music based off of real emotions and experiences. Writing is therapeutic to me. Sometimes that's a single song and this time it was four songs, which became my debut EP, Exident." Dennis continues, "It's about the phases I experienced following an intense breakup and I'm hoping those who have experienced heartbreak connect to it in their own personal way." The project threads together a big screen-worthy true story first hinted at on 'Nevermind' and elaborated upon with the first Exident single and recently released hit, 'Never Go Back'. Within a few weeks of its release, 'Never Go Back' has surpassed 40 million global streams, reached the top 200 Spotify chart in 23 countries, reached #1 on the overall Apple Music and Spotify charts in Israel, has been in Spotify's Viral 50 chart in 25 countries, and has garnered critical praise from Complex, TIME, Billboard, Clash, and Forbes among others. Impressively, Dennis currently has over 9.2 million monthly listeners on Spotify, cementing him among the platform's top 300 artists. The EP follows his unbelievable journey. After completing three years of service in the Navy, Dennis moved to Bangkok in search of a creative haven. Basking in the quiet space of a single bedroom apartment, left with no WiFi and only his instruments, laptop, and a microphone, he spent one year creating. It was during this time that Dennis composed and recorded 40 songs, including 'Nevermind', about a Colombian woman he met and fell for while traveling in Bangkok. Continuing their relationship following their travels, he then penned 'Never Go Back' after their eventual breakup in Israel. He would follow up "Never Go Back" by penning three other songs, chronicling the tumultuous relationship that inspired these tracks; each song's theme describing a different emotional phase he experienced following the break up. Exident begins with 'Introducción' a frank Spanish monologue, where Dennis directly speaks to his ex-girlfriend, closing his address to her with "I'm sorry for what I'm about to say. I love you. Forgive me." For the official music video for 'Never Go Back', Dennis took trips to Sri Lanka and Tel Aviv in order to shoot the cinematic clip on location in Asia and Israel. Against these beautiful backdrops, 'Never Go Back' displays the high points of the relationship with his ex in passionate detail, intercutting moments of love-struck bliss, seductive reprieve, and emotional intensity. A vertical video"shot innovatively via the perspective of his ex-girlfriend's iPhone"accompanies the music video as a prequel. On Sunday 4/7, he brings these songs on the road with his headline Never Go Back Tour, kicking off in Vancouver. He plays major markets coast-to-coast and makes stops at Coachella and Governors Ball before reaching Australia on May 7th. Check out the full itinerary below. 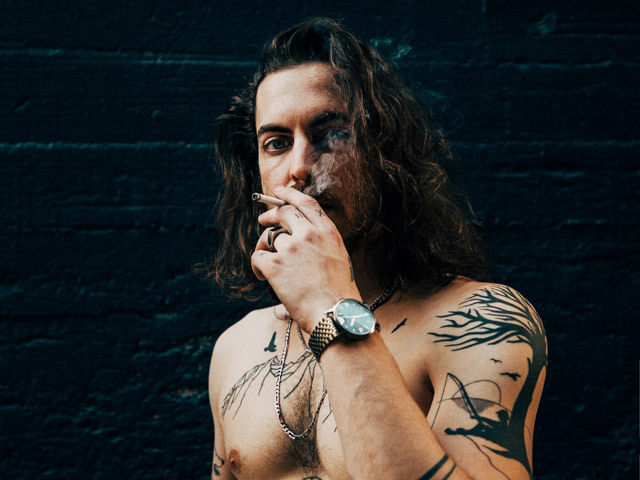 Crossing genres and borders, Dennis Lloyd pushed towards international stardom since his emergence in 2016. Born and raised in Israel, he learned trumpet and guitar as a young kid and eventually incorporated his multi-instrumental talents into dynamic, disruptive, and diverse pop music on his breakout single 'Nevermind'. After self-releasing 'Nevermind', the track began gaining traction (unbeknownst to him while in Israel with no access to streaming platforms) and eventually amassed over 1 billion streams, soared to #3 on Alternative Radio, and went platinum in several territories. It also received critical acclaim from Billboard, Genius and TIME who featured the track in their predictions for the "2018 Song of Summer". Additionally, he was featured as YouTube's Artist on the Rise and made his late-night television debut on Jimmy Kimmel LIVE! Now, he ignites 2019 with his debut EP, "Exident" today via Arista Records.